While on a camping and canoeing trip recently, I used a device which added a touch of completeness to our outfit and made camp life really enjoyable. This useful device is none other than a provision or "grub" box. From experience campers know that the first important factor in having a successful trip is compactness of outfit. When undertaking an outing of this kind it is most desirable to have as few bundles to carry as possible, especially if one is going to be on the move part of the time. This device eliminates an unnecessary amount of bundles, thus making the trip easier for the campers, a n d doubly so if they intend canoeing part of the time; and, apart from its usefulness as a provision container, it affords a general repository for the small articles which mean so much to the camper's welfare. The box proper may be made of any convenient size, so long as it is not too cumbersome for two people to handle. The dimensions given are for a box used on a canoe trip of several hundred miles; and from experience I know it to be of a suitable size for canoeists. If the camper is going to have a fixed camp and have his luggage hauled, a larger box is much to be preferred. A glance at the figures will show the general proportions of the box. It may be possible, in some cases, to secure a strong packing box near the required dimensions, thus doing away with the trouble of constructing it. The distinguishing features of this box are the hinged cover, the folding legs, and the folding brackets. The brackets, upon which the top rests when open, fold in against the back of the box when not in use. The same may be said of the legs. They fold up alongside the box and are held there by spring-brass clips. On our trips we carry an alcohol stove on which we do all of our cooking. The inner side of the top is covered with a sheet of asbestos, this side being uppermost when the hinged top is opened and resting on the folding brackets. The stove rested on this asbestos, thus making everything safe. The cover is large enough to do all the cooking on, and the box is so high that the cooking can be attended to without stooping over, which is much more pleasant than squatting before a camp fire getting the eyes full of smoke. 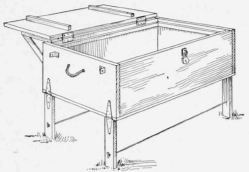 The legs are hinged to the box in such a manner that all of the weight of the box rests on the legs rather than on the hinges, and are kept from spreading apart by wire turnbuckles. These, being just bolts and wire, may be tucked inside the box when on the move. The top is fitted with unexposed hinges and with a lock to make it a safe place for storing valuables. In constructing the cover it is well to make it so that it covers the joints of the sides, thus making the box waterproof from the top, if rain should fall on it. A partition can be made in one end to hold odds and ends. A tray could be installed, like the tray in a trunk, to hold knives, forks, spoons, etc., while the perishable supplies are kept underneath the tray. Give the box two coats of lead paint, and shellac the inside. The wire braces for the legs are made as follows. Procure four machine bolts, about 1/4 in. in diameter and 2 in. long - any thread will do - with wing nuts and washers to fit. Saw or file off the heads and drill a small hole in one end of each bolt, large enough to receive a No. 16 galvanized iron wire. Two inches from the bottom of each leg drill a hole to take the bolt loosely. Determine the exact distance between the outside edges of the legs when the box is resting on them. Make the wire braces 1 in. longer than this distance so that the bolts will protrude through the holes in the legs and allow for putting on the nuts and washers. Screwing up on the nuts draws the wire taut, thus holding the legs firm. The size of the top determines the dimensions of the folding brackets which support it when open. These brackets may be solid blocks of wood, but a lighter and more serviceable bracket is constructed as follows. If the top is 20 in. wide and 30 in. long, make the brackets 10 by 13 in. Constructing the brackets so that their combined length is 4 in. shorter than the total length of the box, facilitates their folding against the back of the box when not in use. This point is clearly shown in the drawing. Our brackets were made of 1/2-in. oak, 1 1/2 in. wide, and the joints halved together. They are hinged to the back of the box as shown ; and when folded are held in place by a simple catch. The weight of the lid is sufficient to hold the brackets in place when open, but to make sure they will not creep when in use insert a 1/4-in. dowel in the end of each so that it protrudes 1/4in. Drill two holes in the top to the depth of 1/4in., so that when the top rests on the brackets, these holes engage with the dowels. In hinging the brackets to the back see that they are high enough to support the lid at right angles to the box. The box here shown is made of 7/8 in. white pine throughout. The legs are 7/8 by 2 1/2by 18 in. They are fastened to the box with ordinary strap hinges. When folded up against the box they do not come quite to the top so that the box should be at least 19 in. high for 18-in. legs. About 2 in. from the bottom of the legs drive in a brad so it protrudes 1/8 in. as shown. This brad engages in a hole in the spring-brass clip when folded up as shown in the illustration. If in a fixed camp, it is a good idea to stand the legs in tomato cans partly full of water. This prevents ants from crawling up the legs into the box, but it necessitates placing the wire braces higher on the legs. Our box cost us nothing but the hardware, as we knocked some old packing boxes to pieces and planed up enough boards to make the sides. Of course, the builder need not adhere to these dimensions, for he can make the size to suit his requirements, while the finish is a matter of personal taste. A blue writing ink is easily made of 1 oz. Prussian blue, 1 1/2oz. oxalic acid and 1 pt. of soft water. Shake and allow it to stand until dissolved. While camping, remember a hot stone wrapped up makes an excellent substitute for a hot-water bag..